One of the many use cases that LogicHub customers have implemented and benefited from is that of automating the monitoring of users writing files to external USB drives. Automated analysis of logs related to external file copies and automate the escalation of alerts for suspicious activity. This gives the SOC consistent monitoring of the logs, potentially helping with both DLP needs and/or audit requirements. Logs for files written to external drives can generally be found in a couple places depending on the environment including antivirus (AV), endpoint detection and response (EDR), or data loss prevention (DLP). A SIEM connection can be used in order to get the raw logs into LogicHub. Once there they can be parsed, analyzed, and trimmed down to a subset for either human analysis and/or escalation. For this flow Symantec SEP logs were used. The raw logs are ingested into LogicHub and parsed for processing by the flow. After both parsing and whitelisting has been applied the remaining logs are ready for either human analysis or escalation. In addition, we want to track USB file writes per user per day and look for outliers that could indicate a possible change in behavior. This type of monitoring can be performed with LogicHub with a feature that is built into the product itself, a feature called “baselining”. A baseline allows you to compare current (most recent) behavior with past behavior to determine whether the current behavior is consistent. This is helpful in determining deviations in users’ or systems’ behaviors. We can use the existing playbook to gather the data for the baseline, and then from there we can define how much data to capture and use as a historical barometer for comparing a user’s actions against their past actions. The baseline playbook has the captured data at the top and from there takes input of 1 day of activity on the left side, and 14 day history of activity from the right side, and then those are processed by the baseline scoring node. The baseline scoring node assigns both an “lhub_score” and an “lhub_confidence_score” to each unique row from the left input node. The lhub_score can be translated as a severity and the lhub_confidence_score is just as inferred, the confidence of the assigned lhub_score. From this point the thresholds for both lhub_score and lhub_confidence_score can be decided upon. A takeaway from the sample score logs below is to notice that each Domain_User and IP_Address pair are scored according to their own baseline history. For one user 31 files written to a USB in a day warrants a high score, while for another it takes 200 files to be considered an anomaly. 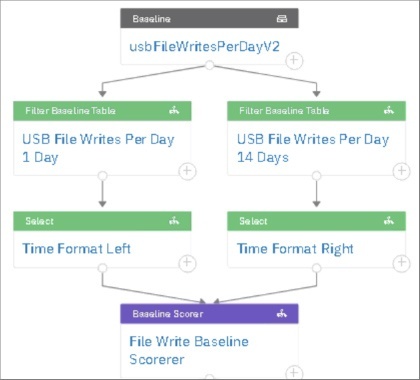 LogicHub’s intelligent automation goes beyond orchestration and data enrichment to automatically perform baseline analysis on normal behavior, in this case for copying files to external drives. The same baseline function can be easily applied to any other data source for more accurate and effective alert triage and prioritization. In this use case, the security team was able to not only automate a job, but also gained a new anomaly detection method.